Loretta Young (January 6, 1913 – August 12, 2000) was an American actress. Starting as a child actress, she had a long and varied career in film from 1917 to 1953. She won the 1948 best actress Academy Award for her role in the 1947 film The Farmer&apos;s Daughter, and received an Oscar nomination for her role in Come to the Stable, in 1949. Young moved to the relatively new medium of television, where she had a dramatic anthology series, The Loretta Young Show, from 1953 to 1961. The series earned three Emmy Awards, and reran successfully on daytime TV and later in syndication. In the 1980s Young returned to the small screen and won a Golden Globe in Christmas Eve in 1986. Young, a devout Roman Catholic, worked with various Catholic charities after her acting career. 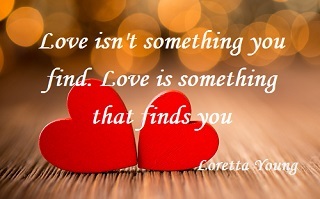 "Love isn&apos;t something you find. Love is something that finds you"
Love is when the other person&apos;s happiness is more important than your own - H. Jackson Brown, Jr.